Looking for a Footasylum student discount to save when you’re buying those trainers? We’re delighted to confirm that there is currently a 10% Footasylum student discount. To get it validate your student id and you’ll be issued with a special code to use at the check out. *Just to let you know we use affiliate links and earn a small commission. This helps us fund this site to bring you all these fabulous student discounts. Looking to buy some of the latest trainers from Nike and Adidas? Maybe you’re looking for some great sports fashion wear or something comfy for wearing down the gym – or the pub for that matter! Well Footasylum is for you. It has a huge range of sportswear to choose from. There can be lots of different results when trying to see whether there is a Footasylum student discount so that’s where the Student Squirrel comes in. Is there a UNiDAYS Footasylum, NUS or Student Beans discount? So fantastic news straight off the bat. There is a Footasylum student discount of 10% off all full priced items and this is how you get it. So we’ve established that there is a fantastic 10% Footasylum student discount code. But did you know that there are even more ways to save at this trainers store? There is a sales page on the website which has some great discounts on a number of sports lines including trainers, boots and shoes. Check out our super savings section at the top of the page. This is regularly updated with any voucher codes, big sales and special deals. Sometimes there are Footasylum promo codes released that are even better than 10%. Check out our voucher codes chapter below for more info. And one final tip from the Squirrel himself! 3. Is there a UNiDAYS Footasylum, NUS or Student Beans discount? There are now 3 big student discount schemes in the UK: NUS, UNiDAYS and Student Beans (and of course us!). Each of them have a different offering and have exclusive codes with different retailers. 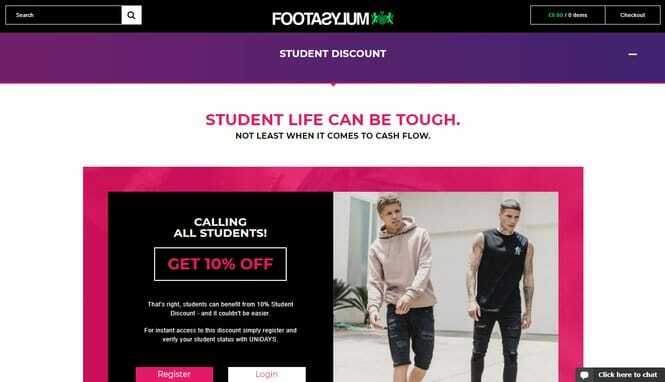 We get asked a lot whether there is a Footasylum student discount through these schemes so we’ve done some extensive researching so we can answer your questions properly! So the fab news is that there is a Footasylum UNiDAYS student discount. To get it you need go to this page on footasylum.com, follow the instructions and you’ll be issued with a fantastic 10% voucher code to use at the online checkout. We’ve found out that this code is valid on full priced items only but is an excellent bonus for all you university goers. There is no NUS Footasylum scheme at the moment for students to save. This includes not being included in the NUS Extra card scheme which is a shame as it would make it super easy. HOWEVER, NUS students effectively still can get the UNiDAYS discount and get the code as described above. Nope, there is no association with Student Beans. This would make things easier, but you can still get the 15% promo code for free through UNiDAYS. The savings don’t stop there though students. Read on to get some more excellent savings tips including voucher codes, sales alerts and more! So first off the bat there is a 10% Footasylum student discount code which is valid off all full priced items. To get it check out our savings section. However, this awesome sports shoes retailer sometimes release general voucher codes that anyone can use, you don’t have to verify your university, school or college status and makes saving all the easier which we love here at Student Squirrel. We list all current general discount codes at the top of the page in the savings section so make sure you take a look. Using the codes is super easy to do if you’ve not used them before. Just add your fabulous trainers or boots to the online basket, then when you’re at the check-out at footasylum.com, enter the code and the relevant reduction or offer will automatically be applied. One of the best ways to save on your fabulous new boots, trainers or shoes is when there is a big sale on. Footasylum embrace Black Friday and Cyber Monday and usually have a sale with up to 50% off. They include a lot of footwear lines that aren’t usually in the sales so it’s a good way to bag a bargain so keep your eyes open. 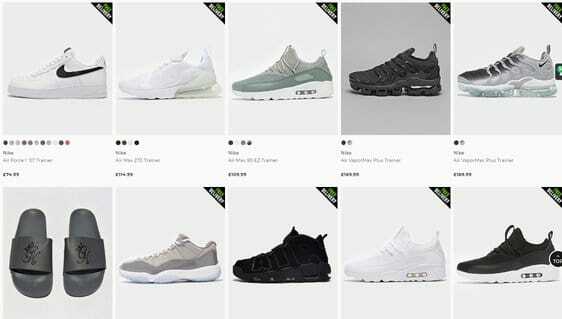 Around mid March there is a have a mid-season sale on footasylum.com. So the Squirrel has already established that there is a Footasylum student discount. But the savings don’t end there. He’s had a look about footasylum.com to find some great value footwear for you pennywise students and this is what he’s found! The only shoes for Spring-Summer this year, sliders are making an unprecedented comeback with every designer labour clambering to get a pair out in time for the warmer weather! We adore this Calvin Klein pair, a classy and sleek pair of sliders in line with the CK you know and love, and not overly expensive compared to other labels. This pair is made from a single piece of plastic material, moulded expertly for comfort and cushioning, and can be easily cleaned and buffed with water and a cloth for a year-round bright and new appearance. Student Discount Squirrel’s favourite colours are white with black CK branding, but there’s a whole host of designs available, so you can take your pick! An easy-to-wear and adaptable pair of plimmies, these Flossy Espadrilles can be worn with just about anything throughout the warmer seasons and are a basic shoe rack staple for all. A rubber sole is graced with a soft material upper, and an elasticated ankle makes for an easy pull on and off. Discreet Flossy branding appears on the heel (actually a great place for it, as it keeps the material sturdy on an area where cheaper shoes often ruffle and break down) but the rest of the design is plain and simple in white. Replacement shoelaces for any shoe, Crep is the only brand you should look at when purchasing high-quality laces. A fiver may seem a little steep for a pair of shoelaces, but you’ll find that these don’t fray, stain or degrade on pressure points like cheaper alternatives do. The unique Crep Protect Technology is infused directly into the fibre material, keeping them repellent to liquid and dirt so that your shoelaces don’t give away how old your shoes are; which is all too often the case! They’ll stay fresh and white and with a sturdy shiny gold-coloured wrap at the ends for a premium feel… even if you have opted for a cheaper trainer, no one will ever know! So dear students that is it, we’ve come to the end of our Footasylum guide. Keep an eye out for general voucher codes for bigger discounts. Footasylum plc is one of the UK’s premier footwear brands, full to the brim with designer label trainers and shoes across their 65 high street shops and their online e-commerce website. Aimed at consumers aged 16-25 primarily, the majority of this fab footwear company’s business is done online and their website looks to offer a seamless e-commerce shopping experience for all, across all devices. This digital approach allows the brand to generate related shareable content such as blogs, articles and images across social media, to help promote the stock available as far as possible. This works for Student Discount Squirrel – that’s our cup of tea, our age demographic and an approach we like! Footasylum’s range of footwear is updated on a daily basis to bring in the latest and most in-demand pieces, and currently spans men’s shoes, women’s shoes and a children’s collection, as well as a small sports brand clothing range. The current brands available include the likes of Adidas, Armani, Birkenstock, Converse, Crocs, Dr Martens, Kickers, New Balance, Nike, Reebok, Toms and Von Dutch. The range of brands available is second-to-none to both high street and independent retailers anywhere else in the UK. Taking a fashion-led approach to footwear rather than a functional one, Footasylum displays its stocks in a range of modelled fashion photos and offers outfit suggestions alongside them, rather than just promoting boring stock photos that give no indication of how the shoes may actually look on the consumer. This is great for wardrobe and wear inspiration! Footasylum appreciate how difficult it can be being a skint student, and so offer a 10% student discount as standard: both online and off! In-store, this discount can be redeemed by simply presenting a valid Student ID, or on their e-commerce site, signing up through Uni Days. Whilst you’ll find that most of the brands on offer through Footasylum are far from budget, the quality and longevity of premium labels will mean that you don’t need to purchase again and again and instead can enjoy a few pairs of shoes for longer, saving money in the long run and avoiding the false economy and questionable ethics of fast, cheap fashion. The Footasylum brand was founded back in 2005 by David Makin, a well-known name for being one of the co-founders of JD Sports plc. Taking his expertise in retailing high-end sportswear and leisurewear brands and applying it to a footwear only setting, he started working on a store concept that could out-perform JD’s stock range in a boutique setting aimed a slightly younger market. John Wardle, Makin’s co-founder of JD Sports, later joined him on-board at Footasylum too, helping to nurture and promote the brand growth throughout new towns and cities in the UK. 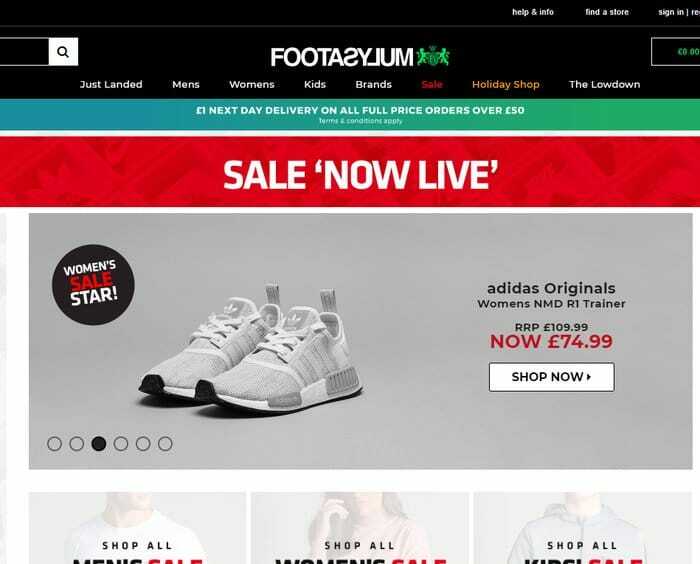 Footasylum is aimed at 16-25-year-old market and so expanded hugely online when it was found that this audience preferred to browse products on their devices and shop virtually. This growth allowed the brand to hold lots of stock, including numerous exclusive ranges and pieces, as well as to generate related content on fashion, sports figures and the most popular designer brands. Today, it is considered the destination for sneaker shopping for many, particularly for brands and pieces that can’t be found anywhere else. This brilliant store was established in 2005! They now have 65 stores and are growing fast! They are super-popular with students and stock top class trainers including Adidas and Nike! They love to find new and exciting brands! JD Sports has a fantastic range of trainers and urban sportswear and now has a 10% JD student discount. Schuh has more fashion footwear but again has a 10% student discount code. Footlocker has some great sale discounts. Looking for some basketball trainers? Converse have some funky ones.